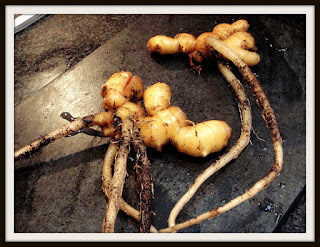 It was either brave or foolhardy to harvest my ginger plants live at the Secret Garden Club in our Grow Your Own Curry session on Sunday. We dug these triffid-like roots, above, out from a pot where I'd planted a single piece of ginger root 10 months ago. I've been documenting the growth of these ginger plants on this blog since January, when I planted the root. 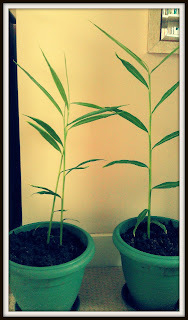 Over the summer, the plant grew tall and architectural, then, about six weeks ago, the foliage turned brown and wilted. By the time we came to harvest the ginger at the Secret Garden Club, all I had to show for 10 months of raising ginger were two pots of compost with no visible plant growth at all. 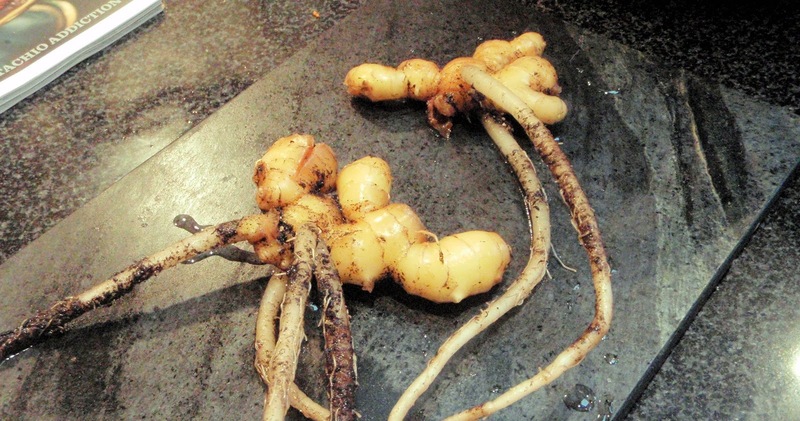 In truth I did check one pot the day before to make sure I would have some ginger root to lift on the day itself, prodding the soil until I could find a good solid mass of new root. As the other pot had been nurtured in identical conditions, I reckoned it was safe enough to leave that one undisturbed until the big unveiling. 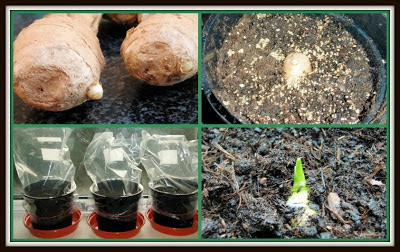 Clockwise from top left: (1) look for ginger root with visible yellow nodule - these will develop int shoots when you plant them; (2) sink the root in a pot of compost with the nodule facing upwards - cover the rot cover with a layer of compost; (3) cover the pots with a clear plastic cover and place somewhere light (but not in direct sunlight) and consistently warm, 24 degrees Celsius or more; (4) our first shoots appeared after about 30 days. 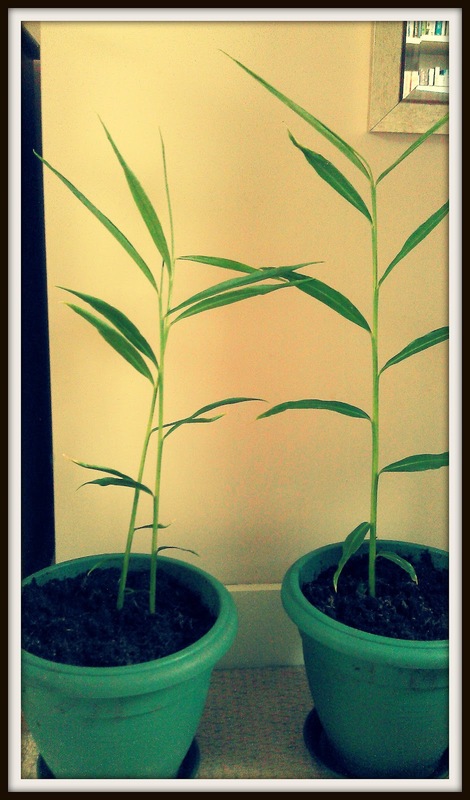 Ginger plants growing tall over the summer. I was intrigued to see Nicky's Seeds offering Walla Walla sweets seeds earlier this year. Walla Walla sweets are a type of onion grown for their high sugar content and sweet taste. I posted on this blog about these and other sweet onions, such as the Oakley onion, grown here in Essex. That post was in March, so the Walla Walla sweet onion seedlings were just germinating. I planted them out at the allotment in a raised bed in late April, and happily they did very well. The bulbs swelled up just at the height of summer, if you can say that last summer had a height, and I lifted them in August. They did rather better, in fact, than the 'ordinary' Sturon onions and Red Barons, both of which were disappointingly small. So I'm looking forward to growing Walla Walla sweets again, although I believe the Walla Walla name is subject to the north American equivalent of appellation controllee and so once the seeds are sown here they should perhaps now be called North London sweets. Doesn't quite have the same ring to it, does it? Once the onions reach the kitchen - and they should be eaten fresh: not only do they have a higher sugar content than other onions, but also a higher water content which makes them less suitable for keeping in store - the sweetness means they can be eaten raw without making you cry. Indeed these are excellent for anyone who is prone to tears when slicing or chopping onions as the side effects are noticeably less severe. Thinly sliced Walla Walla sweets perk up salads beautifully. They added a lovely mellow note to Spanish omelette, made lovely syrupy onion marmalade - also fantastic added to a reduced sugar apple sauce for a relish-style accompaniment to pork.